1. What was the most difficult part of the writing process? Writing the album was actually the easy part for me! The writing process flowed effortlessly. I was fortunate to collaborate with some talented songwriters including Chris Graham, Eddy Ruyter, THE iDENTiTY CRiSiS and Matt Zaddy. I’m the kind of person who has melodies popping into my head all of the time. I actually wrote close to 30 songs during this process and we had to ‘trim the fat’ to select the final 7 songs that were featured on the EP. The difficult part of the project was learning how the production and recording process works, and ‘trusting’ that everything would turn out in the end - which it totally did! This was the big lesson for me. 2. What made you lose sleep during the recording process? The chaos of the creative process…a combination of my fears and desire to control the project. I needed to LET GO! There were some major life lessons that I learned while working with producer Anthony Panacci. He taught me that the creative process can’t always be controlled or stuck in a timeline. Albums have a life of their own, and he didn’t want to rush the creative process. Anthony wanted us to create music that we would be truly happy with; music that would still sound good 20 years down the road. I feel that we’ve done that. There were obstacles in the recording process and we had to delay the release. I let this stress me out. However, when we brought in the session musicians including Mark Kelso, John Johnson, Tony Zorzi and Collin Barrett to record my tunes, that was one of the happiest days of my life! There is nothing more thrilling for a songwriter than to hear your songs come to life. There were blissful moments in this process mixed in with very challenging experiences. All in all, I’m grateful that the music is completed and I can humbly offer the songs to the world. I hope it brings joy and happiness to many listeners around the world. 3. What inspired your song writing on this album? These songs were inspired by LOVE. Love in all forms. Romantic love, healing love, love for community, love for family, for peers, the dream of love…love for those who are healing broken hearts. I went through some rough times in my late 20’s. Overcoming my own struggles and finding love again was one of the most beautiful things I have ever experienced. It’s like you can’t truly be grateful for love until you have had a broken heart. Once you find love again, it feels like a miracle. It was this personal experience that inspired my record. These songs flowed from my heart, not from my mind. It was a JOY to write prolifically for these past two years. 4. The liner notes have an impressive talent list. How did you select the musicians? Love in Colour was produced by Anthony Panacci who is an award-winning musician and Humber College Jazz Professor from Mississauga. We recorded the EP in his Mississauga studio, Tracks Ahead. Anthony called on his talented colleagues from the Humber College Jazz Department to play on the recording. These cats have played for superstars including Michael Bublé, Chaka Khan, Bonnie Raitt, Beyonce, you name it! The musicians included Mark Kelso, John Johnson, Tony Zorzi and Collin Barrett. Anthony has played with these musicians for decades and they are the masters of ‘groove’. My sound is ‘throw-back’ with elements of Jazz, R&B and Pop. So having these top Jazz players on the recording was a blessing for me. I have so much to learn from all of them! I also worked with Matt Zaddy and THE iDENTiTY CRiSiS who are life-long friends and music collaborators. Matt and I are always writing and performing together. We often write in the car while driving, bouncing melodies and lyrics off each other. Paul was my secret weapon on this album, he wrote many of the songs with me, and did the drum programming. He is a very talented musician and I’m grateful for his contribution. 5. What song was the easiest to record and why? The final track on the EP is a Jazz tune called “Wouldn’t it Be Nice?” that I wrote with Chris Graham. It was actually the first song that I wrote while starting this process. It was so easy to record this song as the lyrics came straight for my heart. The song almost feels like a prayer to sing. It’s a song about hope, about believing that life will work out and all the pieces are coming together in your favour. The band recorded it in practically one take! 6. What detailed advice do you have for other musicians looking to record/release their debut collection of music? First off, know you can do it! If it’s in your heart to create, you will overcome any obstacles. Turn a deaf ear to the naysayers (including your own doubts). Find a good producer with a solid track record. Listen to your gut and don’t let the creative process stress you out. Perhaps you can do some crowd-funding to help off-set the expenses. No matter how difficult or effortless your process is, if you create music that comes from a true place inside you, people will connect with it and it will speak to them. I can’t even believe the warm reception that my EP is getting! I think it has everything to do with the fact that the songs came from an honest place inside me and I wasn’t afraid to write about my personal challenges and joys. There was such a drive in my soul to make this record. If you have that drive, nothing can stop you. 7. Is it true Modern Mississauga is your favourite magazine? It is true that Modern Mississauga is amazing publication doing incredible work to share true stories in our community! 8. Why did you organize the track list the way you did? Good question! As a listener, I wanted the EP to take you on a journey that explores different kinds of love. We start off with “We Could Be Lovers” then “Colours of Our Love” - fun and flirty songs. Then we move into “River of Dreams”, my Bossa Nova inspired song with some Spanish lyrics. Then the record features a meaty ballad, “Blessed by You” that I penned with Eddy Ruyter (who is now travelling the globe playing keys for Shawn Mendes!). We had a featured appearance on the EP by my husband Matt Zaddy on the next track “Freedom” and then we end off with “Our Time Has Come” and “Wouldn’t it Be Nice”. 9. Describe your mental state once you fully finished recording the album. I am so happy and relieved now that we have completed and launched the record! It feels amazing! I am so grateful to the community and my friends and family who were rooting for me throughout this process. I’m not going to lie, releasing an EP is out of my comfort zone, so I still struggle with moments of discomfort but that is what growth in life is all about! I am learning to embrace the fear and open up to this new chapter in my life. 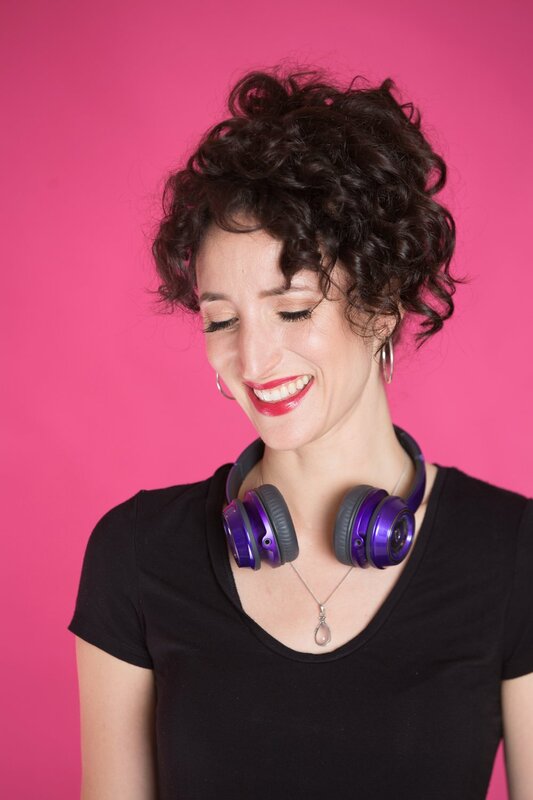 What encourages me is to see how the music connects with listeners and that in itself serves a larger purpose. 10. Are you going to perform live to support the album? If yes, where? Oh yes! I am doing a soft-launch for the EP with Carla Canela and her band Souladikts and the Matt Zaddy Band on Friday, February 8 at the Moonshine Café in Oakville. Seating is limited, please call 905-844-2655 to make a reservation. 11. The artwork on the album is wonderful. What inspired it? I was lucky to work with two talented artists. All of the photography was done by award-winning photographer and filmmaker Pasquale Marco Veltri at the Port House Social Bar here in Port Credit, Mississauga. The graphic design was by Darryl Melo from Atomic Arms Studio. The album cover was inspired by the journey of growth. It depicts going from living “in the dark” to living life in vibrant “colour”. Darryl put creative colour splashes around me to create this effect and to symbolize this spiritual growth. 12. You’ve got a mesmerizing voice. How long have you been singing for? Thank you! I have been singing since childhood. 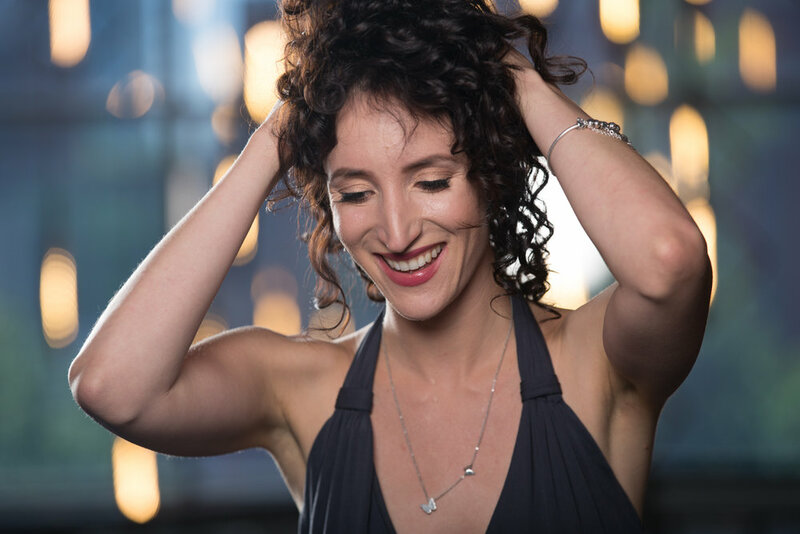 What I love about singing is the outlet for creative and emotional expression that it provides. I truly believe that everyone can sing if they learn how to. It’s like a muscle that you can develop and strengthen. There is something deep within the soul that needs to express. I find it so calming to sing! 13. Where can people find/buy the album? 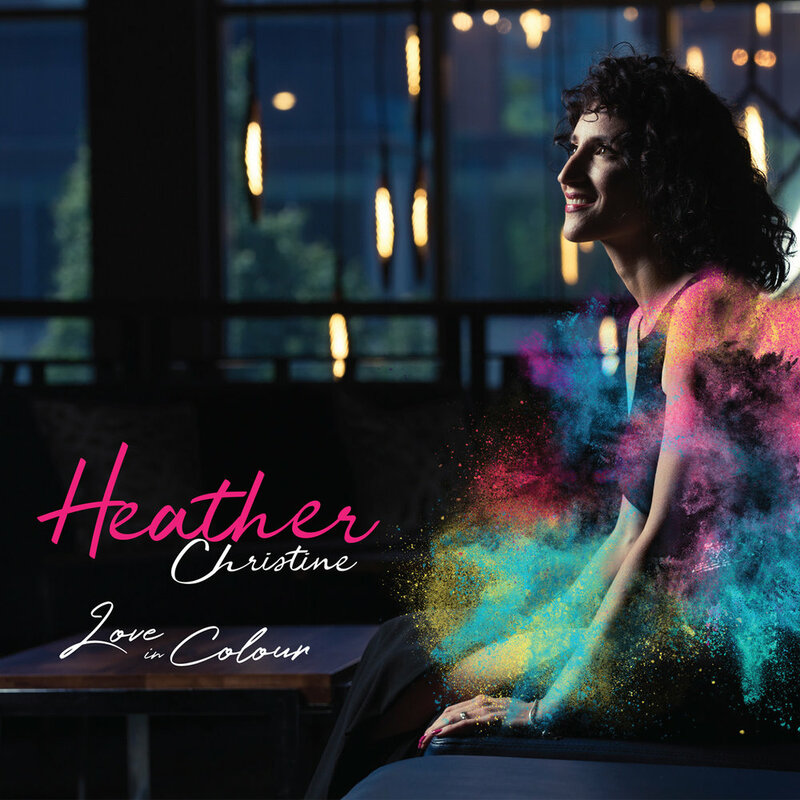 People can buy the EP “Love in Colour” on my website at heatherchristine.ca or on iTunes, Spotify, CD Baby, Apple Music and Deezer. You can also purchase a hard copy from me through my website. 14. Thinking back to the recording process, what were your perfect moments? 1. Writing the songs. 2. Recording with the full band in the studio. 3. Getting the finished CD in my hand and playing it in my car stereo. What a happy day!